With an eye to Syria’s postwar period, Iran is working to unite the ranks of the “resistance camp” to continue the struggle against Israel and deepen the dissension in the Arab world. 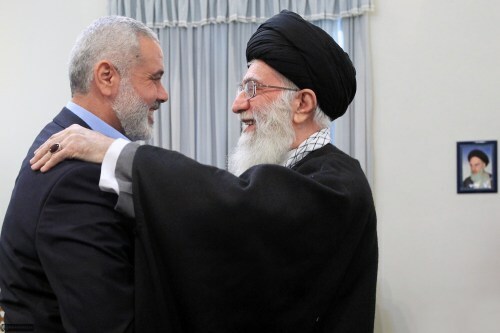 Iran views Hamas, despite its independent path, as an important element of this camp that challenges not only Israel but also the main members of the “moderate” Arab camp, and hence contributes to bolstering its influence in the region. On June 15, 2007, the Hamas movement took decisive control of the Gaza Strip and expelled the Fatah movement and the Palestinian Authority. Today, amid Hamas’ ongoing distress, the changes in its leadership both within and outside of Gaza, and the dwindling of its funding, political, and civil support, the movement is seeking to warm its ties with Tehran once again. At the end of August 2017, Yahya al-Sinwar, who was elected in February 2017 as head of Hamas’ Political Bureau in Gaza said that after years of tension between Iran and Hamas since the war began in Syria, relations between the two had been restored and termed them “excellent.” According to al-Sinwar, this would affect the efforts of the resistance to liberate Palestine and destroy Israel. Al-Sinwar stressed that Hamas was “continuing to prepare its members for the task of liberating Palestine…and the Islamic Republic of Iran is playing a central role toward achieving this objective with financial and military assistance and the training of Hamas’ military wing – Izz ad-Din al-Qassam Brigades.” He described Iran’s assistance “strategic” in fighting the “Israeli occupation,” but added that Hamas is not interested (at present) in a war with Israel and is even acting to prevent one so that “the Palestinians will be able to rest.” However, al-Sinwar stressed, Hamas “does not fear a war and is prepared for it.” Al-Sinwar who was freed in the 2011 Shalit prisoner release deal, is one of the leading and founding figures of the movement’s military wing. At the beginning of August 2017, a senior delegation from Hamas’ Political Bureau visited Tehran. It was led by Ezzat al-Resheq, Saleh Arouri, Zaher Jabarin, and Osama Hamdan. The delegation was responding to an Iranian invitation to the head of the Hamas Political Bureau, Ismail Haniyeh, to take part in the inauguration ceremony for the second term of President Hassan Rouhani. The group met with senior Iranian figures including Majlis Chairman Ali Larjani; Foreign Minister Mohammad Javad Zarif; Ali Akbar Velayati, the special political adviser to Supreme Leader Ali Khamenei on foreign relations; and with officials of the Revolutionary Guard. At the beginning of 2017, Hamas had sent condolences to Iran on the death of former President Akbar Hashemi Rafsanjani. On August 6, 2017, Ali Baraka, Hamas’ representative in Lebanon, said against the backdrop of the Tehran visit that Iranian-Hamas relations had been restored and that the two sides had agreed not to delve into past issues that had clouded their relations. Instead, they would look ahead and cooperate on behalf of the Palestinian interest so as to prevent “the negation of the Palestinian problem” amid the regional circumstances. Baraka added that “Iran is aware that the steadfastness of the resistance [Hamas] is vital to it, just as Hamas recognizes that relations with Iran strengthen the Palestinian resistance, especially [because] Iran is the only country that supports the resistance with money and weapons.” The Hamas representative added that Ismail Haniyeh would soon be visiting Iran. Israeli intelligence has recently called attention to the fact that Hamas is increasing its presence in Lebanon under the patronage of Iran and the Shiite axis that it leads. Another meeting with Iranian officials took place on September 6, 2017, between the chairman of the Iran-Palestine (and Lebanon) Parliamentary Friendship Group, Amir Khojasteh, and representative in Tehran, Khaled Qadoumi. Khojasteh termed Palestine as the most important issue to the Muslim world and urged Palestinian groups to realize that armed resistance and unity are the only way to fight “the Zionist regime” and that peace negotiations are futile. He promised that the friendship group would provide all the needed assistance to the Palestinian people and their resistance. He also conveyed Majlis Chairman Ali Larijani’s greetings to Hamas and its newly elected head of the political bureau, Ismail Haniyeh. Arab social networks reacted harshly to the participation of the “treasonous” Hamas leadership in the inauguration ceremony of “Rouhani the terrorist.” The delegation was accused of brazenly betraying “the Sunni ummah [people]” and of indifference to the Arab blood that Iran continues to spill in Syria and Iraq. Before the visit, the Saudi newspaper Al-Riyadh posted on its Twitter account that “a delegation from the terrorist Hamas leadership will attend the swearing-in ceremony of Iranian President Rouhani” and has prompted much talk in the network along with reactions by Hamas. Although the tweet was eventually removed from the site, screenshots of it inundated the network. The relations between Iran and Hamas, which had already known ups and downs in the past, turned frosty when Hamas refused to support the efforts of Tehran and Hizbullah to ensure the survival of Bashar Assad’s regime. Hamas had to leave its headquarters in Damascus from which it had run its activities in the West Bank and Gaza, and the then-chief of the political bureau, Khaled Mashal, was exiled to Doha. Hamas’ warming of ties with Qatar and attempt to rehabilitate its relations with the Gulf States reached a peak with Mashal’s visit to Saudi Arabia in 2015, to the chagrin of the Hamas military wing and Tehran. The election of al-Sinwar, one of the top figures in the military wing and a hawk, marked a turning point in the movement’s relations with Tehran. Al-Sinwar and previous Hamas military head, Muhammad Deif, favored sustaining the relationship with Iran even during the period when the political wing opposed it, and it appears that the new Hamas leadership is taking a more hawkish line. Tehran hastened to welcome the al-Sinwar appointment, assuming that it would bolster the hawkish elements in Hamas who want to keep the armed struggle against Israel. Thus, Iran’s influence and involvement in Gaza will grow, both in preparing for and conducting a further round of escalation with Israel. In addition, Hamas’ own center of power has moved to Gaza since Haniyeh’s election in May as head of the political bureau in place of Khaled Mashal (who was based outside of Gaza). Iran has an interest in augmenting this new balance, which distances Hamas from the so-called Arab moderate camp, in general, and from the Gulf States, in particular. The issue also has major implications for the Palestinian population in Gaza. Whereas Iran’s assistance to Hamas concentrates on its military infrastructure – missiles, rockets, and tunnels – the aid from the Gulf States, primarily Qatar, and Egypt, even if it trickled into Hamas’ hands, was aimed at the rehabilitation of the Strip and the welfare of its population. Over time, this new situation could well aggravate the distress in Gaza and even lead to another round of military escalation. At the same time, over the years, Iran has had difficulty imposing its influence on Hamas, which retains a large degree of independence. Whether Hamas warms or cools its ties with Iran reflects its internal state of affairs, its status in the changing regional arena, the situation in Gaza, and its relations with the Sunni Arab states. The criticism leveled at the Hamas delegation that visited Iran for Rouhani’s inauguration certainly indicates the great complexity and limited room to maneuver entailed in Hamas’ relations with Iran, as Iran strives to impose Shiite hegemony on the Sunni Arab domain. In this case, it was Saudi Arabia, which leads the struggle against Iran’s attempts to achieve regional hegemony, which chose to attack Hamas as part of that struggle. Hamas is well aware of the price it pays in the Arab arena for its rapprochement with Iran. However, its economic and diplomatic distress, along with the extremist nature of its new leadership, have left it no choice. Iran, for its part, takes great pride in its ties with Hamas (and with Palestinian Islamic Jihad, which is completely subordinate to it and dependent on its aid). Iran is committed to spearheading the “resistance camp” and the ongoing struggle against Israel and its rejection of any diplomatic solution to the Palestinian issue, as it strives to gain a foothold and future influence in both the West Bank and Gaza. Behind Hamas’ thaw with Iran in recent months is its domestic distress. The fraying of Hamas’ relations with Palestinian Authority Chairman Mahmoud Abbas, who kept cutting back the PA’s aid to Gaza as part of his power struggle to control it, has fostered a deteriorating economic and civic reality in Gaza marked by electricity, water, and health crises, as well as salary cuts. The Gaza residents pin the blame for the worsening state of affairs on Hamas, along with the PA, Egypt, and Israel. In the regional arena, Hamas’ relations with the “moderate” Arab camp, led by Saudi Arabia and Egypt, remain fraught with tension. Cairo demands that Hamas cut its ties with the Muslim Brotherhood and stop benignly neglecting and even assisting terror groups operating against Egypt, even though a change in Hamas’ conduct would mean the Rafah crossing could be regularly opened. In the military sphere, Israel is building an underground barrier along the Gaza border that threatens one of Hamas’ strategic offensive assets: the attack tunnels leading into Israeli territory. Senior figures of the Hamas military wing will turn to Iran for help in finding a way to circumvent this threat, just as Iran proved willing to help Hamas in developing its rocket array, its drones, and other weapons such as antitank missiles and sniper rifles, along with help in constructing advanced explosive devices. Iran can also assist Hamas with the knowledge and operational experience it has accrued in combat arenas in Iraq, Yemen, and Syria, as well as maritime activities, particularly its experience gained assisting the Houthis in Yemen. In this regard, Brigadier General Hamid Abazari, the deputy commander of Imam Hossein University and affiliated with the IRGC, said that the IRGC sends its commanders and trainers to “proxy battlefields” and “resistance fronts” to gain battlefield experience in asymmetric warfare tactics and strategies. The thaw with Iran will probably also harden Hamas’ position on a possible deal for the Israeli civilians and the bodies of Israeli soldiers that it is holding. The Arab Spring indeed passed over the Palestinian entities in the West Bank and Gaza; there was no overthrow of regimes or serious destabilization. However, the continuing upheavals in the Arab world have removed the Palestinian issue far from the spotlight. The Palestinian factions no longer influence the Arab agenda; instead, the factions are influenced by the agenda and sometimes play the part of a currency, or even a tool in the hands of the main regional power brokers – Iran, Saudi Arabia, and Egypt – as these states struggle to define their interests in the complex reality of the changing Middle East landscape. The Palestinian issue in general and Hamas in particular, are becoming part of the cardinal intra-Arab disputes and of the rival camps forming in the Middle East along the Sunni – Shia divide, as Tehran’s shadow lengthens. Iran is exploiting the Sunni Arab weakness and division as it strives for regional hegemony. Under these circumstances, the Sunni Hamas movement, which has proved itself by launching thousands of rockets – some of them Iranian-made – at Israel, constitutes a good investment for the long run in light of what Tehran continues to regard as the weakness of the Sunni Arab world. For Hamas, the thaw in relations with Iran is also likely to pave the way to a reconciliation with the Assad regime, to position the movement on the Shiite axis that extends from Iran to Lebanon, and to intensify its disputes with Egypt, Saudi Arabia, and the Gulf States. Iran, for its part, will not have a hard time convincing Damascus to welcome the Hamas leadership and reopen the movement’s headquarters in Damascus in the aftermath of the war.